Hoya 77mm filtre polarisant circulaire Pro-1 Digital. Filtre polarisant pour le contraste des couleurs et mise en valeur sans affecter l’équilibre général de couleur. Circular Size 77mm. Mount Fitting Threaded. Hoya CPL Filter-Filtre 77 mm Description Light rays which are reflected by any surface can become polarised so polarising filters are used to select which light rays enter your camera lens. CIR-PL filters allow you to remove unwanted reflections from non-metallic surfaces such as water, glass etc. They also enable colors to become more saturated and appear clearer with better contrast. This effect is often used to increase the contrast and saturation in blue skies and white clouds. 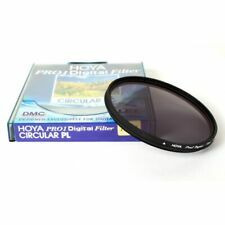 Hoya 77mm HD Circular Polarizing Filter. 25% Greater Light Transmission than Standard Polarizing Film. ♢ Circular Polarizer. Circular Size : 77mm. This increases color saturation, bringing better clarity and contrast while leaving the overall color balance unaffected. HOYA Pro1 digital DMC filtre circulaire PL 77mm pour appareils photo numériques. Marke Hoya. Taille : 77mm. Boîte de filtre de protection UV. Multi-coating numérique. This effect is often used to increase the contrast and saturation in blue skies and white clouds. HOYA's polarising filters do not affect the overall colour balance of a shot. KEY FEATURES. FAMILY RUN SINCE 1954. HOYA's polarising filters do not affect the overall colour balance of a shot. Hoya 77mm Slim Circular Polariser Filter. Professional quality polarizing filter from market leader Hoya. Enhances the colours of your photographs and removes unwanted reflections. Does not affect autofocus operation. Designed to adjust brightly reflected light especially sunlight (reflected off of water or snow) and reduce unwanted glare. Coatings applied to both surfaces to suppress reflection and increase light transmission. HOYA 82mm CIRCULAR POLARISER HMC FILTER. The effect can be seen through the viewfinder and changed by rotating the filter. Multicoated to minimize reflection at the filter surfaces which reduces flare and ghosting. Genuine Hoya 72mm HD CIR-PL Digital Circular Polarizing Filter. This is a brilliant high quality filter kit which includes one Kenko 77mm UV Smart Multi-Coated and one Kenko Circular Polarising. FUNCTIONS OF THIS KENKO CIRCULAR POLARISING (CIR PL) FILTER. FUNCTIONS OF THIS KENKO UV MC FILTER. This effect is often used to increase the contrast and saturation in blue skies and white clouds. 1x Circular Polarising Filter. Circular Polarising Filter. The Hoya HMC Digital UV (C) Filter is a multi-purpose fine-weather filter that absorbs the ultraviolet rays which often makes outdoor photographs hazy and indistinct. Hoya 77mm Slim Circular Polariser Filter. Polariser Filter. Hoya 77mm Slim Circular. This new polarizing film is also used in the latest HD LCD TVs. The glass of the HOYA HRT filter also has UV absorbing properties making the HRT a combination UV & Circular Polarizing filter. HOYA is also the world's largest optical filter manufacturer. These are new 77mm HD Circular Polarizing Filters. Specialized coatings that are not just water-proof to repel water spots but also hardened to be scratch and stain resistant. Of course these coatings are from HOYA so they are greatly reduce reflections off the surface of the glass allowing you to capture more light in your photos. HOYA 77mm PRO1D Circular Polarising CIR-PL Filter CPL Genuine. Condition is Used. Dispatched with Royal Mail 1st Class Large Letter.